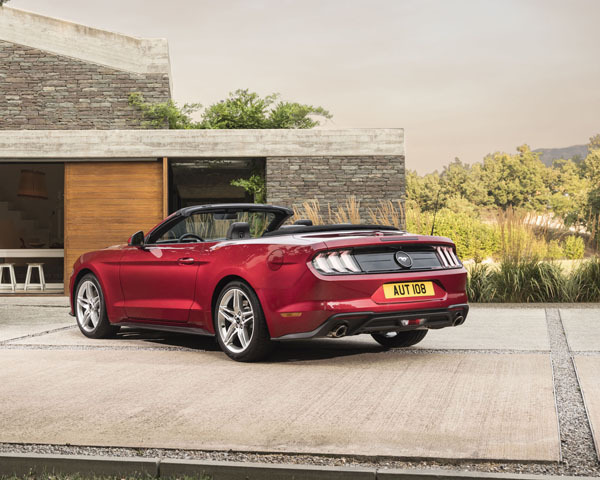 A significantly upgraded Ford Mustang GT V8 was launched four months ago, now it has been joined by the revised lower-cost Ford Mustang EcoBoost. Though the thought of a four-cylinder engine in a Mustang is anathema to some, there’s a lot to be said for the driving dynamics of a lighter, better balanced Mustang. Mustang EcoBoost adds an advanced 224kW powertrain to that unmistakable, iconic Mustang design. 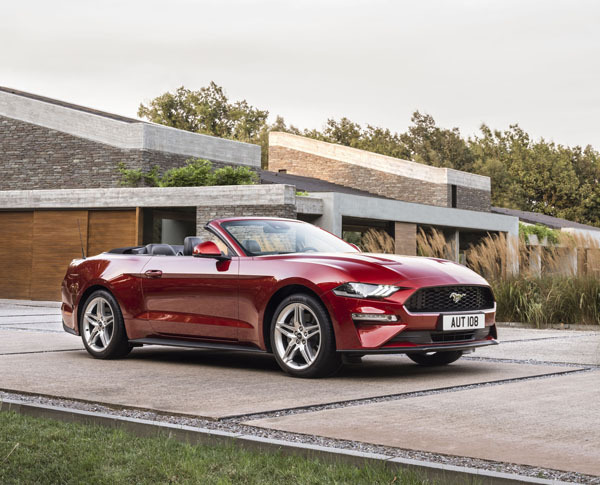 The 2019 Mustang EcoBoost has a high-tech direct-fuel-injection 2.3-litre that uses a twin-scroll turbocharger. Producing 224kW of power and 441Nm of torque it is mated to a six-speed manual or an optional new 10-speed paddle-shift automatic. Biggest feature in the EcoBoost, as well as the V8 GT, is Ford’s new design 10-speed SelectShift automatic. It features a wide ratio span and optimised gear spacing. Compared to the superseded six-speed auto, the new 10-speed transmission improves shift times, low-speed tip-in response and reduces friction losses. Ford’s six-speed manual, again for both engines, has been upgraded for optimal torque, and now includes a dual-mass flywheel to deliver more efficient clutch modulation, delivering improved higher torque capability. Even its exhaust note can be adjusted using a fully variable soundtrack to match the entire acceleration range. Four modes are on offer: Normal, Quiet, Track and Sport, tailoring the exhaust note for every occasion. Available in convertible and sleek Fastback body styles, Mustang EcoBoost has a lower, remodelled bonnet and a tougher looking grille. They have a new bumper, fascia and an optional performance spoiler. It rides on 19-inch black alloys, though which the big Brembo brakes are clearly highlighted. For the first time, the entire Mustang line-up features all-LED front lights and there are revised LED taillights. a black rear diffuser houses quad-exhausts, with rolled finishing. Inside are higher quality finishes and smart design elements on the dash and console coverings and there’s a revised spun aluminium look dash applique. A new 12-speaker 1000-Watt B&O Play audio system is standard on Mustang EcoBoost. It drives through a 10-channel amplifier that has been specifically tuned for the car. 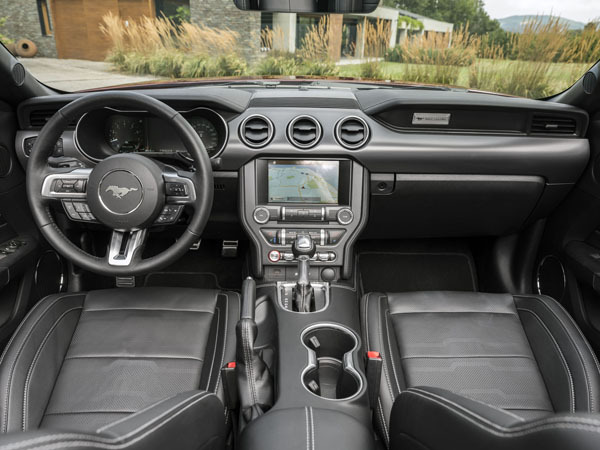 New technology updates for Mustang include a 12.4-inch all-digital LCD instrument cluster with displays that can be customised the displays for Normal, Sport and Track modes. Drivers can also choose colour and gauge layout settings. Ford SYNC 3 is standard on 2019 Mustang EcoBoost and offers Apple CarPlay and Android Auto compatibility. The 2019 Mustang EcoBoost comes with a five-year, unlimited distance warranty. Additional benefits available to eligible customers at participating dealers include Ford’s Service Price Promise, Service Loan Car, Sat-nav Map Updates, Low Price Tyre Guarantee price match program and Auto Club Membership. Note: These prices do not include government or dealer delivery charges. Contact your local Toyota dealer for drive-away prices.